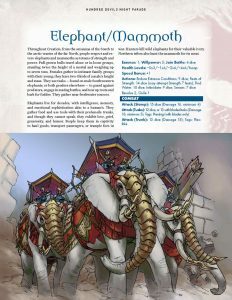 Now available in PDF from DriveThruRPG: the Pugmire Core Rulebook! Watch Ivan Van Norman, Amy Vorpahl, Hector Navarro and the rest of the crew from Geek & Sundry’s No Survivors play Pugmire in The Reign of Meow’Gul! 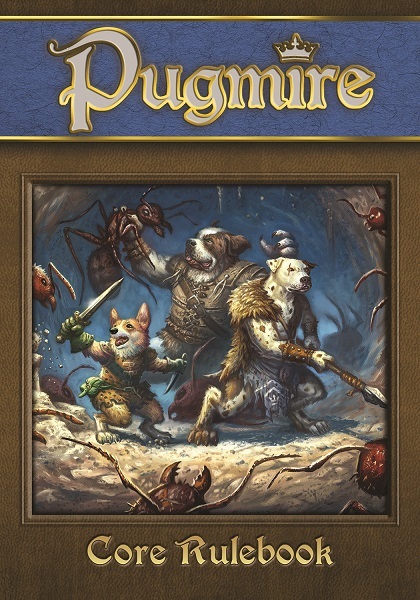 Pugmire is also currently available for order in print from Studio 2. Let your FLGS know! Coming soon to Indie Press Revolution! 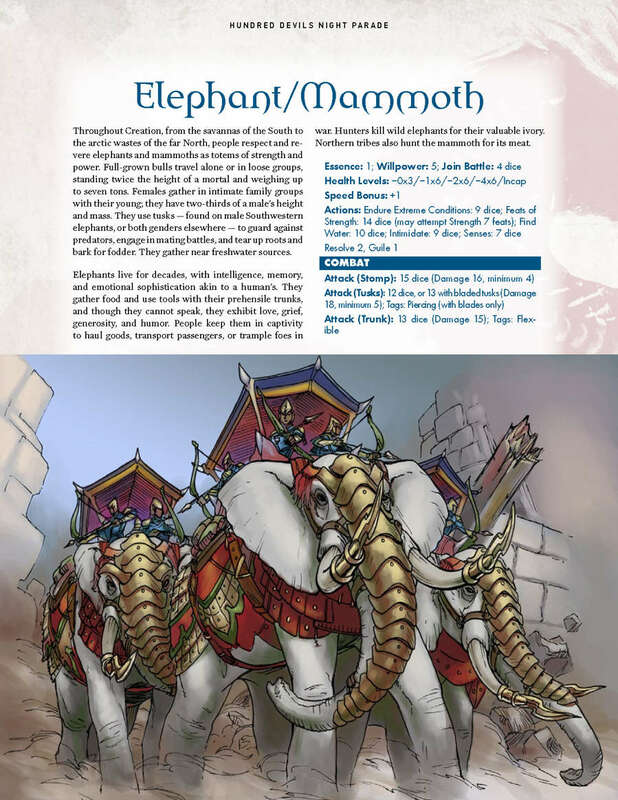 Also available in PDF: Hundred Devils Night Parade part 4: Elephant/Mammoth and Fulope! Will people who bought the Early Access version receive of copy of the full release? For people who lives in europe: the printed edition will be available on drive-thru or other stores? As above, it can be ordered via Studio 2. They’re the same people who handled distribution for the Kickstarter. Sadly, we in continental Europe need to pay 55 dollars for shiping. While Studio2 has their online store, they are also putting Pugmire into distribution into retail stores, so if you have a local store that stocks tabletop RPGs, you might want to get them to order it for you. There are chance that it will be available on drive-thru on pod? Ultimately, but not immediately there will be a PoD version. No worries! Pugmire is a fun game and all, but I really hope Monarchies of Mau won’t be written in first person. It’s a roleplaying game and not a memoir. Eddy reflecting over himself in the general Pugmire text is kind of off-putting and doesn’t feel like it belongs. Counter-point: I really love the use of first person in Pugmire. It makes the game feel more personal. Please keep it for Monarchies of Mau! Since Mau is written by a team, and not primarily by me, I’m not sure yet whether it’ll be first person or third. That’s something I’ll consider when I get to the development phase. What constitutes a roleplaying game actually has a pretty broad definition, with various usages of first, second, and third person writing, unreliable and omniscient narrators, fiction mixed with rules-style writing, etc. Sorry that Eddy’s chosen method of relating his RPG’s info doesn’t work for you personally. Pugmire has always been a very personal project for all of us involved, especially Eddy as it is his baby, and the book reflects that involvement. We also felt that for the many, many newcomers to RPGs that are being drawn to Pugmire, the conversational first person approach would be helpful and welcoming. As Rich said, my use if first person was very intentional for many reasons. Sorry it was off-putting to you! It’s all about personal taste in the end. I just wanted to express my opinion about this direction. I’m still buying the products, backing the kickstarters and playing the games. Somewhat random question, what’s the ISBN-13 for Pugmire? I’m trying to get into the chain bookstore I work at, but I need to do some legwork. Monarchies of Mau went recently into pre-order stage at BackerKit. Pugmire is listed as pre-order product. Now If I were to pre-order Pugmire throught the Monarchies of Mau BackerKit, will it ship earlier than the expected November 2018? It will ship when the Monarchies of Mau books ship out.